As we enter March, the peak of winter season tourism here in Puerto Vallarta we find the water temperatures remain high. As a result Yellowfin Tuna, Dorado, even Striped Marlin are available at the deepwater locations. Summer fishing in winter, sounds strange I know, but there you are! 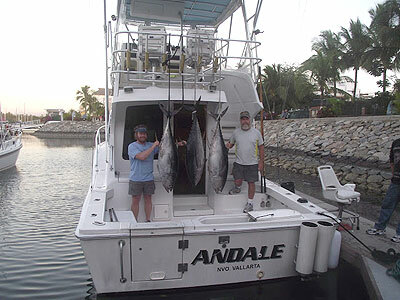 Visitors in Puerto Vallarta are lucky to experience summer species like Yellowfin Tuna at El Banco and Corbeteña. No need to go to the Tres Maria Islands fishery to get your Yellowfin Tuna fix. Warm water temperature in the 70’s is the continuing reason we are seeing this up-side-down season. With plenty of bait there is really no reason for these species to leave and head south for warmer water. Corbeteña is full of Striped Marlin and Bull Dorado as well. Not normal by any measure, we won’t complain about the chance to catch these world class fish in cooler weather and not melting in the summer heat and humidity. 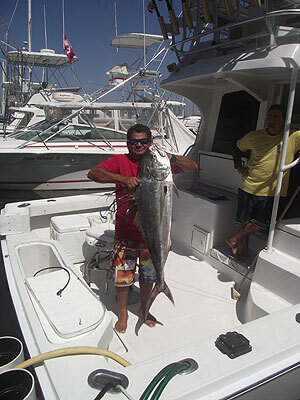 The Marietta Islands are alive with Rooster fish, Snappers, Sierra Mackerals, Pompano, Bonito and the list goes on. If the fishing isn’t enough to get you on the water, then the Whales are in their last days, so if you don’t get a chance to view these spectacular creatures, it’ ll be another year since you have this chance. Welcome to march, holidays, fiestas, you name it, it’s time to party in Vallarta, keep safe and have fun!